Jeff Ensley's journey started like that of many adventurers who go north, with a sense he had been too long in the same place, living the same way, and wanted to see the Alaska he has read about in books. "A wanderlust came upon me," he said. "I've lived a sheltered existence. It was time to go out and become a man of the world." 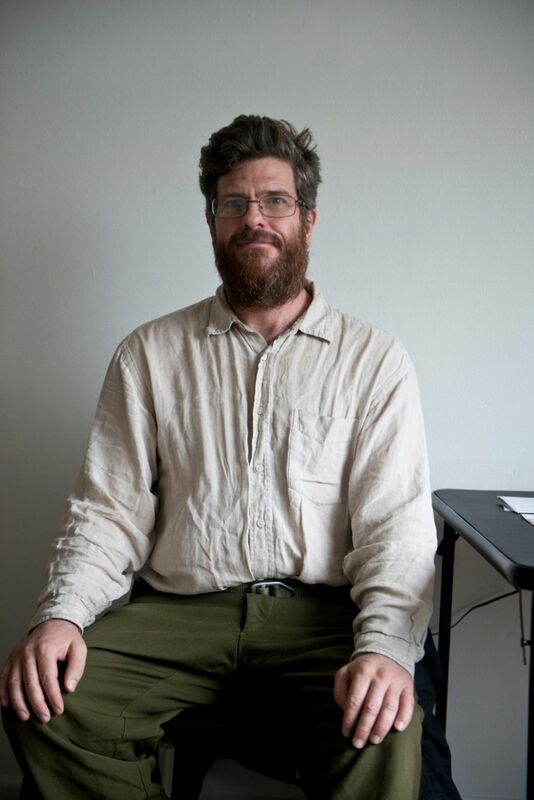 He loaded his belongings in his car in a little town in Sonoma County, just north of San Francisco, abandoned his apartment and his job as a maintenance worker at a state beach, and drove away. "I was feeling like I was being invasively harassed by procedures," he said. "Maybe illusory, maybe a little paranoid." Ensley's story is about freedom. His struggle to find it has been more difficult than most. After living almost 50 years near home, watched over by family and friends, much of that time on anti-psychotic drugs, he wanted to try living on his own, without medication. He ended up in Anchorage, adding to the population on our sidewalks and in our woods, and nearly froze to death. 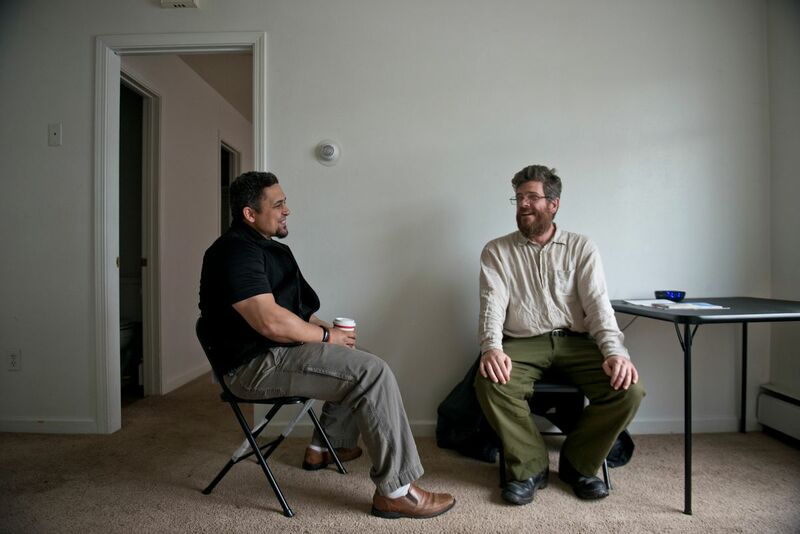 But mental health workers who go out to the camps helped him, part of a system that seeks to maintain the freedom and dignity of the homeless mentally ill, while keeping them safe and housed. Ensley's dignity struck me immediately. He sits erect and speaks with elegant turns of phrase that sound like words from a 19th century novel. He has spent much of his life in the world of books, not talking to people. Our interview was a great act of courage, for which I was deeply grateful. Ensley did it to repay his therapist, Jason Robinson, who got him off the street and supports him every day. Robinson works for a nonprofit called Choices. He believes fiercely in Ensley's right to pursue his own path, without meds. Until I met these men and others with Choices, I never knew about this heroic fight. In high school, Ensley played Puck in "A Midsummer Night's Dream," and fit the mischievous role perfectly, said his older sister, Dawn Larue. For many years as an adult he remained part of a local Shakespeare club, reading lines at meetings. He played chess in a club, too, becoming a rated player and traveling to tournaments. The family started to understand his challenges in his first year of college. After he began behaving bizarrely, his parents—a physicist and a homemaker—brought him home. He got into a highly competitive circus school, too, but was sent home from that as well. "You don't want to know or see what is going on with your loved one, so you pull the blanket over your head and you hope it goes away," Larue said. Ensley got on medication at around age 21. He held his job at the beach for years, sometimes living at home and sometimes in an apartment owned by his retired high school English teacher, who cooked for him. He attended some family gatherings, perhaps dressed in a tweed hat and vest, but kept to himself and left early. He had difficult periods after his father died and after the teacher died. "He was clearly hearing voices," Larue said. "It's just such a hard thing to see someone you love being pulled this way and that way by something you can't understand." When Ensley's mother, who has Parkinson's disease, moved to be closer to Larue, he came along, but he didn't seem to settle in. Last year he left home without warning for the first time. Larue was frantic and filed a missing person report. Ensley showed up in a Starbucks in Oregon, where police picked him up because he wouldn't leave an employee break room. His brother brought Ensley back from a hospital there, but he resisted taking medication, which makes him feel fuzzy. "He said, 'I want to try a different life without that,'" LaRue said. "And I could understand that. He's 49, and he's been medicated his entire life, and he wanted to shake that off and see what he could handle." Ensley hit the road with his car and phone. He had saved money from his job. He would call in from various spots across the breadth of the country. But his paranoid beliefs and voices were clear to people he met. He drove illegally into eastern Canada. Canadian immigration personnel took a lot of time to help Ensley, Larue said, but his car broke down on the border trying to get back into the U.S. and he abandoned it with his laptop and most of his belongings. Police in upstate New York found him sleeping on a park bench. From there, somehow, he got to Anchorage last fall. At first he stayed in touch, but then he let another homeless person use his phone and never got it back. Larue could only reach him by email, through public computers at the Loussac Library. The Anchorage Police Department put her in touch with Robinson and Choices. Larue said Anchorage's police and services stood out as being effective and caring compared to the many she's worked with across the country. In November, Robinson set out looking for Ensley in the shelters and camps. The weather was cold. Ensley's voices kept him moving. He got kicked out of a shelter and avoided people. "This is Seawolf territory, so there is a certain amount of Seawolf mentality, so there could be people in their thrall," Ensley told me. "There were some scary things going on in the shelter areas, so then I would go out and sleep by the road." With the temperature near zero, Ensley headed to the Alaska Zoo. Light snow fell on the Anchorage Golf Course on O'Malley Road as he grew tired. He lay down to sleep in his clothes under a tree. He might have died there. In my next column, I'll tell about the caring people who saved him.